This is a delicious cake that is easy and is company worthy. It would also make a great addition to a holiday brunch. In large bowl, cream butter and sugar til light and fluffy. Add eggs, one at a time, beating well after each addition. Beat in vanilla. Combine the flour, baking powder, soda and salt. Add this to the creamed mixture alternately with the sour cream, beating well after each addition. Spoon a third of the batter into a greased and floured 10″ tube pan. 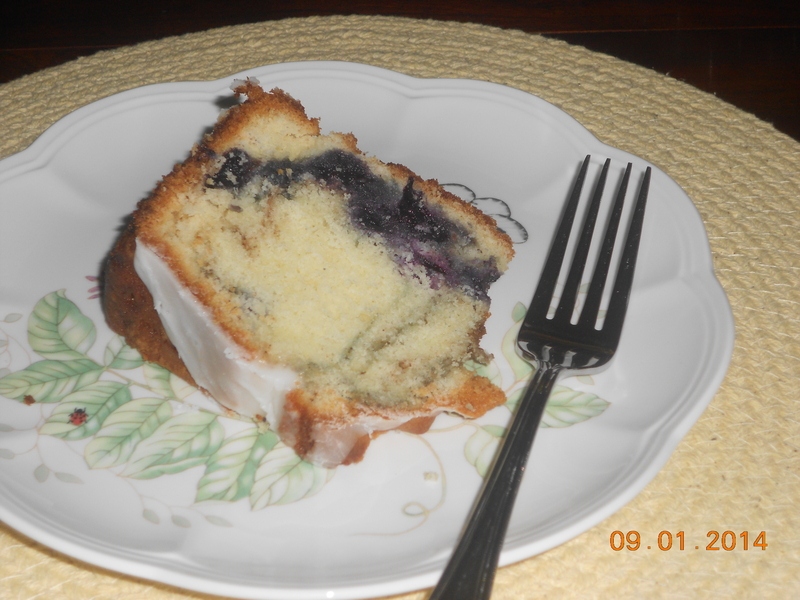 Combine the brown sugar, flour and cinnamon; sprinkle half over the batter and top with half of the blueberries. Repeat the layer, and top will be the remaining batter. Bake at 350 for 55-65 min. using toothpick test. Cool 10 minutes before inverting onto wire rack to cool completely. Make the glaze and drizzle onto cake while it is still warm.